Most spam on your WordPress blog is caused by automated robots (spambots) which keep submitting to your comment form to inflate some shady website’s rank. Short of completely disabling or turning on blog moderation and wasting your time filtering through the mess, you can now use the new WP No-bot Question plugin developed by Compdigitec for WordPress - simply activate, set your question and answers and block all the spam bots! Best used in conjunction with other spam and server protection plugins such as NoSpamNX and Bad Behaviour. This plugin was inspired by the Anti-Bot Question Mod for phpBB, which is very effective against spambot user registration on phpBB. See the plugin page on Compdigitec for more details and screenshots/downloads. I am looking for something just like this that prevents registration, rather than appearing on the comments page. SABRE does that, but the questions cannot be customized. This plugin has a customizable question, but does not block bots from registering. I would love it if it would appear on the actual registration page. Feature has been added in v0.1.1. I see it works here, but on my site (where I’d like also to present it, since it is a freeware site) the plugin won’t show the question. It is activated, it can be configured, but it doesn’t show the quection in the comments form. 3) Ensure that it calls do_action(‘comment_form_after_fields’); before the textarea so that the filtering field can load. I moved both functions above the textarea, but the problem was not solved. This simple change that you suggested (comment_form_after_fields) worked the miracle! I will test the plugin some time before I present it, in order to see if bots are able to defeat it. The question I have is add 11 to 7 then divide by 2. I hope my visitors won’t be confused, I think it is easy enough. Let me also suggest a feature you may find useful. Since the fix for older themes is so simple, perhaps you could add an option at the Settings, where a user would be able to check a box and activate this legacy setting in order for the security question to work on older themes. Is there a shortcode (or lines of code) I could insert in a contact form which would use your anti-spam method? However it’s currently not possible to add questions containing commonly escaped characters, mainly ” (quotation mark). When saving the changes the question get’s truncated and only the escape character (\) is left. Am using version 0.1.2. Is there any simple modification I could make to support this? Good catch! Fixed in 0.1.3. Can I please have an answer to comment #14? I don’t quite understand what you are asking for, since WP No-Bot Question hooks into the “comment_form_after_fields” action to display the question. Your plugin also hooks into the registration form so, I was wondering if the same code could be inserted into a contact form (such as http://wordpress.org/extend/plugins/super-simple-contact-form/). Also, it would be great if your anti-spam plugin could also hook into the “Lost password” form, thus making your plugin one of the best anti-spambot solution for WP. 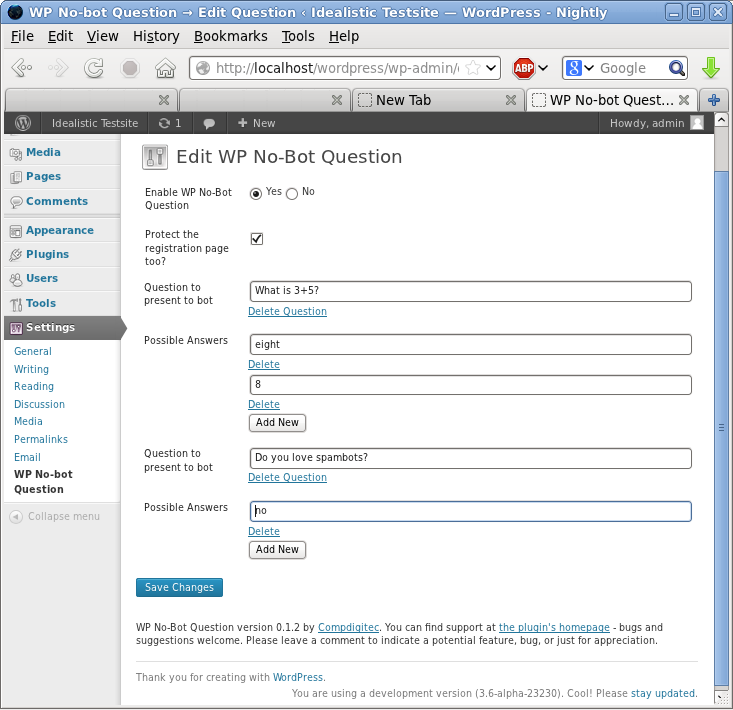 “Wp No-Bot Question Plugin” is great. You can use common questions in order to allow nearly everyone to registrate. But it also allows the admin to ensure that only “insiders” are able to sign in by using question that only an insider of an organisation is able to answer. So far so good. But how can I use this great plugin in Buddypress. I have tried to use it in Buddypress. I saved some customized questions but they do not appear in the registration form. Is there any possibility to make it compatible with buddypress? Thanks! Just installed the update, works great! Can I leave a donation somewhere? Nice to find a good plugin as this one, it works well.